Biennial tour group flies in to Madras Municipal Airport for first stop on tour. 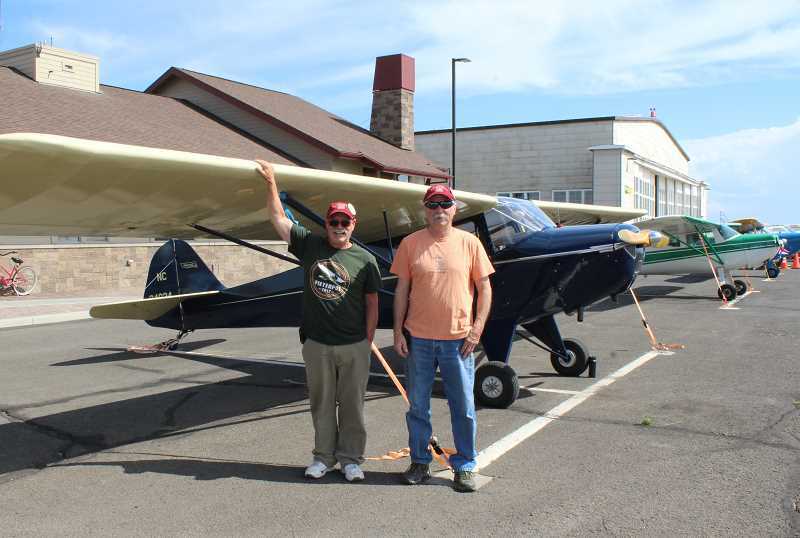 For the first time in its history, the 2018 Oregon Biennial Air Tour stopped at the Madras Municipal Airport Monday, July 16. This year, the tour featured seven small, privately owned, single-engine aircraft, most dating back to the 1940s. Organized by the Oregon Antique and Classic Aircraft Club, the tours are held in even years, making the current tour the club's 18th biennial tour. The tour originated in 1930, as a way to promote private general aviation in Oregon and the Northwest, but interest waned in the 1940s. In 1980, Tim Talen, a pilot and Vietnam veteran, who had served as an air traffic controller for the U.S. Army in Tayninh, Vietnam, formed the club, and decided to organize tours similar to the 1930s tours. "We have a great time," said Talen, who was among 17 group members who flew in to the Madras airport for an overnight visit. "Part of the mission was to get out and fly aircraft and promote aviation." In Madras, the club toured the Erickson Aircraft Collection, and had lunch and dinner provided by Berg Air. "Madras has been incredibly kind," said Talen, who particularly enjoyed seeing the restored antique aircraft, such as the Bellanca Aircruiser, the Japanese Oscar, and the German ME 109. The group has its own aircraft museum, the Oregon Aviation Historical Society Museum in Cottage Grove. The nonprofit museum has about a dozen aircraft from Oregon, or with Oregon ties. On the tours, which usually last about five days, they get a chance to become the tourists, Talen said. After Madras, the group headed to Joseph for a two-day stay, and then on to John Day, before finishing back in Cottage Grove. "They've rolled out the red carpet for us," said Mark Baxter, who flew in in his 1941 Taylorcraft. Baxter was also impressed with the Erickson collection, calling it "topnotch." The group was hosted by Rob and Tracy Berg of Berg Air. "It's fun to see everyone come in and venture around town," said Tracy Berg.